A revolution in pigment relief. 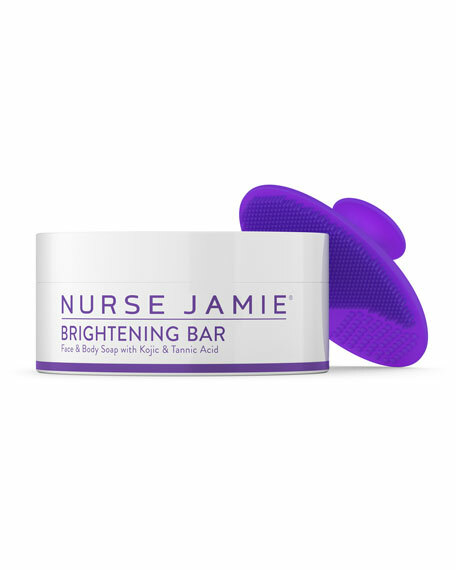 The Brightening Bar is formulated with Kojic Acid to effectively fight discoloration. Perfectly paired with our anti-microbial Exfolibrush Silicone Facial Brush for small and large areas alike. The first of its kind, a revolutionary cleansing bar and beauty tool that doubles as a treatment. The Fade To Light Pigment Erase Bar In A Jar is formulated with Kojic Acid to effectively fight discoloration. Perfectly paired with our anti-microbial Exfolibrush Silicone Facial Brush for small and large areas alike. The Fade to Light Pigment Erase Bar in a Jar is a unique cleansing treatment formulated with Kojic Acid to reduce the appearance of discoloration caused by enviro-aging, acne or other skin conditions. The formula includes the special pigment relief actives, which are released with our easy-to-use Exfolibrush Silicone Facial Brush.